We are continuing our historical art overview (see for example, our "Mysterious Non-Egyptian Pyramids"), this time going all the way back to the beginning of the recorded history. 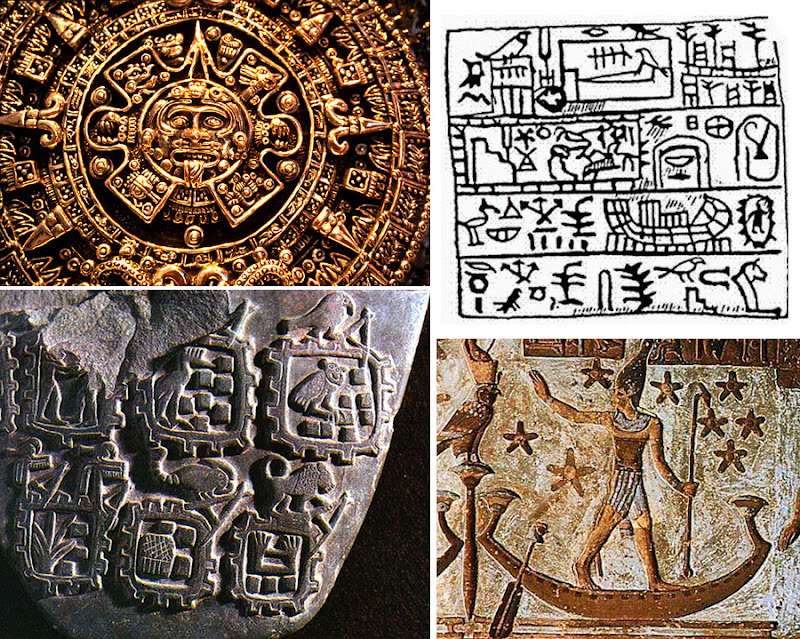 Around 5,000 BC first calendars made their appearance, and set the standard by which we measure our months and days today. 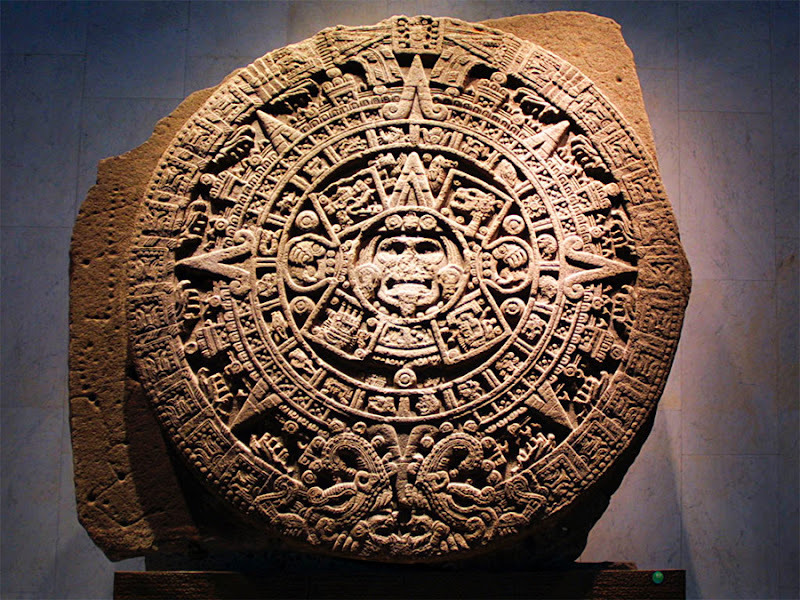 This is the Aztec Calendar, on display at the Museo Nacional de Antropologia in Mexico City, Mexico: it's a huge basaltic monolith (it weighs 25 tons), Aztec called it Cuauhxicalli Eagle Bowl, but it is universally known as the Aztec Calendar or Sun Stone. 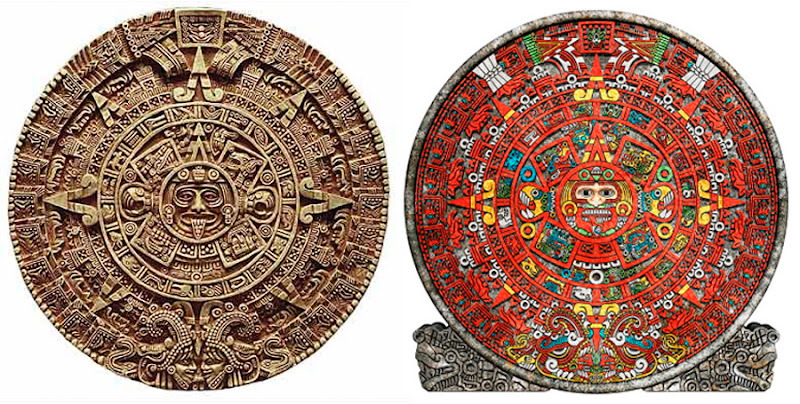 "The Mayans see time like a river. 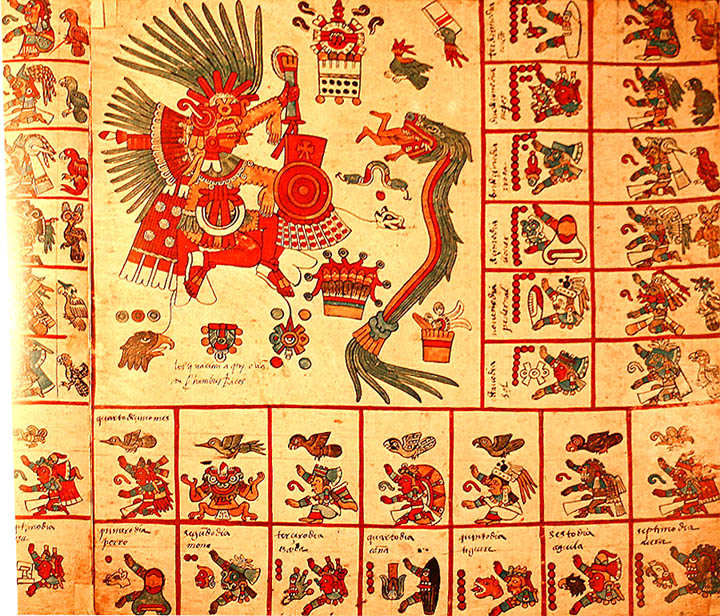 The Mayans also see changes in time as differences of tones, frequencies or even octaves, not just a hard measurement of something that never changes." 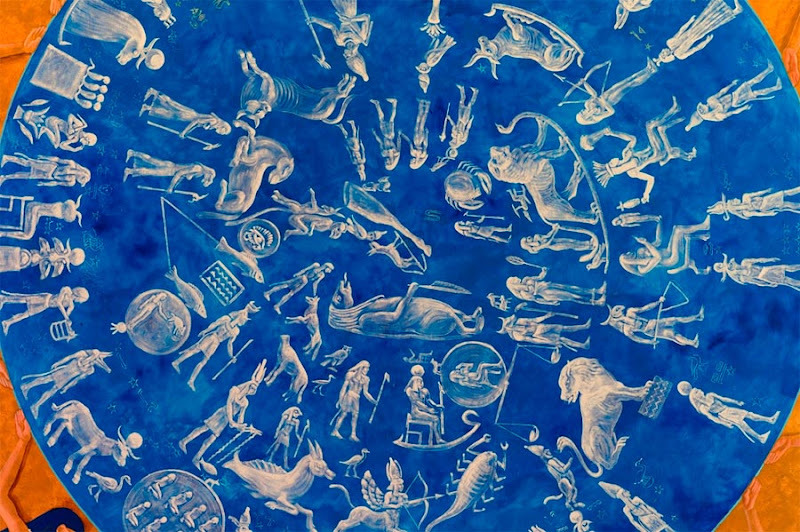 "During Wayeb, portals between the mortal realm and the Underworld dissolved. No boundaries prevented the ill-intending deities from causing disasters." For those interested, in 2012 the Wayeb period falls on March 28 - April 1 (source). In case you're wondering what all these pictoglyphs mean, you can actually visit your local used bookstore and pick up a book "How to Read Egyptian Hieroglyphs". 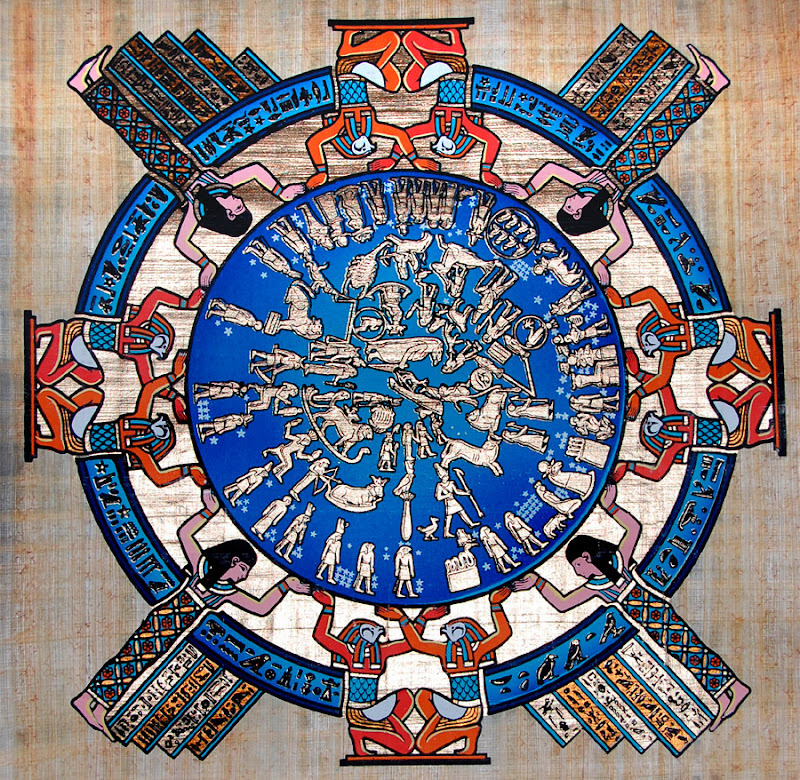 "It is known as the Dendera Zodiac and is a bas-relief from the ceiling of the portico of the chapel dedicated to Osiris in the Hathor temple at Dendera. The map of the stars on a plane projection, showing the 12 constellations of the zodiacal band forming 36 decans of ten days each, and the planets. These decans are groups of first-magnitude stars. 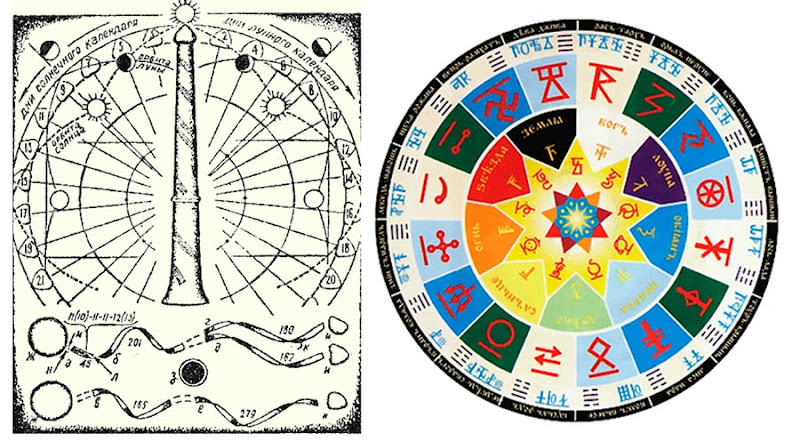 These were used in the ancient Egyptian calendar, which was based on lunar cycles of around 30 days and on the heliacal rising of the star Sothis (Sirius)." - source. More conventional version of this calendar can be seen at Captain Crash DeviantArt portfolio. 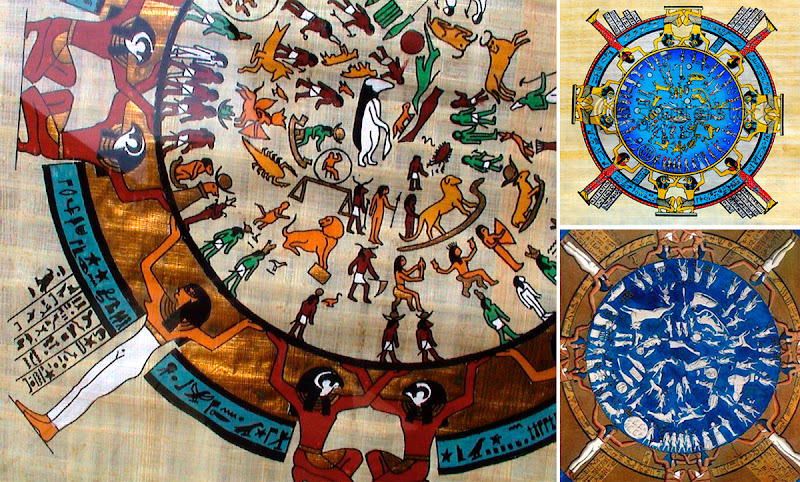 Thank you for crediting my photo on your blog post about Egyptian and Mayan calendars. I have been getting a little traffic from your site, so I appreciate it. In turn, I was able to see your post and the wonderful collection of calendar images.